I've bled scarlet and gray since I was four years old. I had decided to go there for college by the time I was five. Now part of the class of 2020, I'm living the dream as a journalism major, thanks in large part to Eleven Warriors, where I started posting blogs during my senior year of football in high school and haven't stopped writing since. Played the best two positions in football in high school... nose guard and offensive guard. SPORTS MOMENT: Samuel leaping into the end zone to secure a win over the third ranked wolverines so I could storm the field. Baugh yanking down the last of sixteen straight Barrett completions so I could storm the field. Really, before anything else, it's just a motivational tool. Guys still having their black stripe doesn't necessarily mean they haven't earned its removal. Some players play better angry, so they keep it on longer for those guys. Wishing him the best, I'm sure he'll do great things for UNC. He's shaping up to be a pretty good back. In 2016 the two players who wore 46 were walk-ons Ke'Von Huguely and CinQuan Haney. Players typically choose their numbers. I don't think Urban Meyer forces anyone to pick a certain jersey to send a message, and such shaming motivational tactics don't tend to work. Edit: It was a few years ago Smith wore 46, my bad. Finally! There was a move almost every game I watched where I sat there and thought, "why?" I'll be on recap duty tonight for 1st Ohio Battery. Would have attended the game, but alas, I am still a poor college student. I know nothing about League of Legends, but Donny Campbell is now my favorite player. I wasn't claiming to have watched more football or know more than Urban, or anyone on this board. Just stating my opinion as to who the quarterback should be. The whole "I've watched a lot of football" wasn't meant to be condescending, I'm genuinely sorry if you took it that way. I'm still on the Dwayne train. I may be 19 but I've watched a lot of football, and Haskins is the most natural passer I think I've ever seen in college. 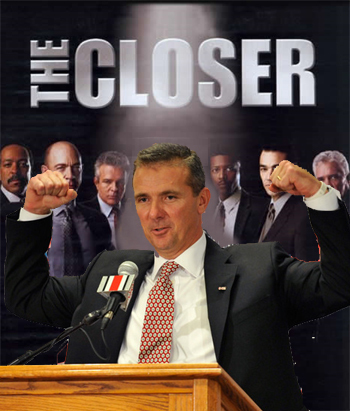 That said, I trust Urban in the end. And really I don't think you can go wrong with any of the three. Hamilton leaves a pretty good hitting pitch for strike three, and the Reds lose of course. Two-run homer makes it 6-5 with one out remaining for the Redlegs. For certain. But without good players, how do you attract fans? It's a self-fueling cycle of misery. Not a good omen for the season when your best reliever gives up a 430-footer on opening weekend. Yep, but they'll probably blow it. As I type that they ground into a double play, 5-3 now with two outs in the eighth. Man on third. Votto HBP, bases loaded with no one out. New pitcher for the Nats. RBI double by Billy Hamilton, Reds down 5-2 in the bottom of the eighth but no outs with baseball's fastest player on second. Typical small-market stuff really. Once you get good, you have to trade away players to teams that can afford them. Also the farm system couldn't develop a decent pitcher if one fell out of the sky and landed in GABP. Meanwhile, the team I root for is looking to get swept by the Nationals. I understood what you meant by both terms. There's just no need to insult people. If you want to sit back, "enjoy the magic," and not over-analyze that's totally fine. Nothing wrong with that. Other people like to dissect and discuss, and there's really nothing wrong with that either. They hurt no one. And people that have played a lot of downs don't have a problem with people breaking down the sport, I promise you. I can guarantee if you said "I just like to sit back and enjoy the magic of the game, if Richard Lagow gets drafted I would love it and it would be a cool story," and left it at that as your comment, you would be +10 instead of -whatever. But the terms "sheeple", "fricking babies" and "sofa expert" come off as insults to most people, myself included, and why insult people for nothing more than enjoying the game in their own unique way? There was no slight towards you or anyone else from most of the people that disagree with the OP. Pssh, next you'll be telling me Christmas is coming in July. And there's a movie starring Rudolph the Red-nosed Reindeer in it. I share some of the blame for that. Mah bad. A bit of a fight broke out at the top. Such things drive comment totals skyward.